Everyone knows who Hirohito is. He's the former emperor of Japan, the guy who led Japan headlong into WWII. He was considered a god, but renounced godhood on the radio. And.. that’s it. That’s about all we know of him. Ok, keep that in mind, but let's jump to another name for a moment. Do you know who Emperor Showa is? The name isn’t heard very often outside of Japan, but he’s actually a very well known figure in the West. Yep, Emperor Showa is none other than Hirohito. 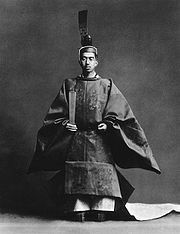 After an Emperor dies, the Japanese public will only refer to him by his posthumous name; therefore anytime the news, a book, a newspaper article, et cetra., talks about the former Emperor, even when he comes up in a casual conversation between two friends, it is always as “Emperor Showa” and not as “Emperor Hirohito”. This really isn’t as strange as it might sound, nor is it as awkward as one day calling him “Hirohito” and the next “Showa”. Actually, in Japan we rarely ever use the Emperor’s given name anyways. When people refer to the Emperor it is always simply as tenno (“emperor”), or more commonly with much more polite words (The emperor may have offically lost his “god” status after the war, but he is still only referred to in the most polite and respecful ways). The only time the public will actually use the Emperor’s given name is when he is a child as it is thought to show affection. Because of this custom of never actualy saying the Emperor’s given name, it’s more like after he dies we can finally say his name. We generally refer to the years an emperor reigned by his posthumous name, so the years between 1926-1989 are called the Showa era. Interestingly enough, one of an emperor’s first acts when he assends the throne is to pick what his name wil be when he dies, and although we can’t call him by the name until he dies, we do use it for the calendar right from the get go (It wasn’t always this cut and dry, but the system became much simpler with Emperor Meiji (1867-1912)). The current Emperor is Akihito, but this is year 22 of the Heisei era. Hope you enjoyed the article. If you spotted any mistakes or just want to say hey, be sure to email me or leave a comment. Thanks for reading!